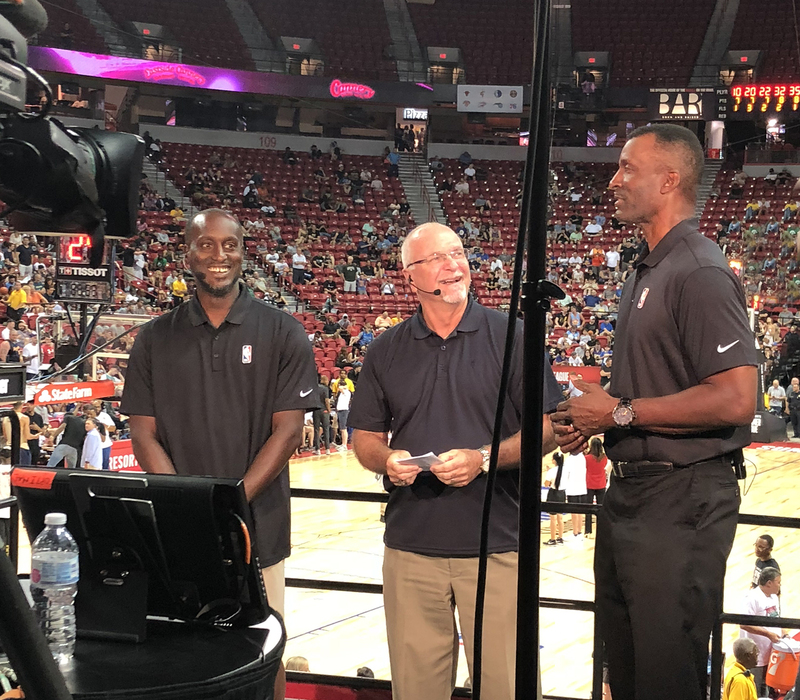 Over the past week in Las Vegas, the NBA and its network partners ESPN and NBA TV have once again used the NBA Summer League as an “Innovation Lab” to experiment with bleeding-edge production technologies. The NBA and its broadcasters are trying out a variety of camera positions at the Thomas & Mack Center — new applications for SkyCam, C360 360-degree systems, removable locker-room robos, a pan-bar robo slash camera, a Hat Cam — as well as new shot-trajectory-tracking and virtual-signage–replacement technologies. 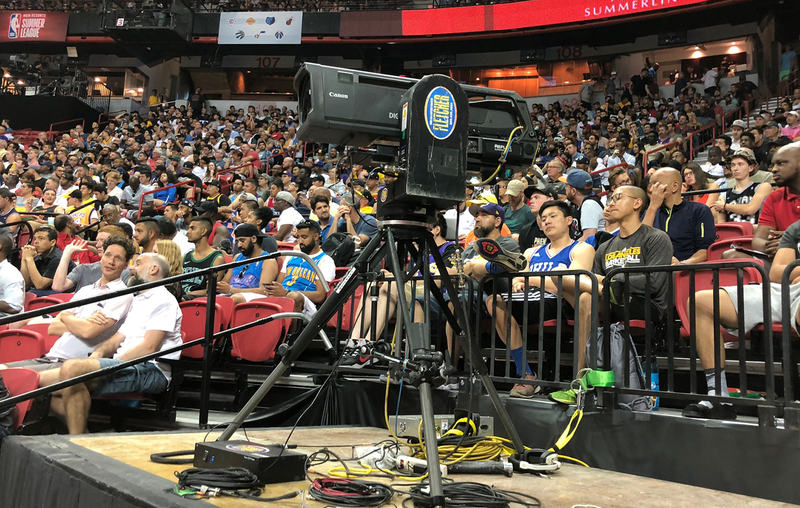 CLICK HERE for Part 1 of the NBA Summer League Spotlight, focused on the league’s testing of new cameras and other bleeding-edge technology. After deploying SkyCam at NBA Finals for the first time since 2012, ESPN has brought the aerial system to Vegas for the duration of its coverage (July 6-17). A pan-bar robo is being used at NBA Summer League in low-slash positions at Thomas & Mack Center, requiring less space to operate than a traditional manned camera. The NBA and ESPN are also working with Fletcher to test new robotic camera mounts in all team and referee locker rooms to allow robos to be easily mounted and removed for pregame, halftime, and postgame segments. “Traditionally, locker-room cameras are difficult to install. They’re difficult also because they can sometimes make players uncomfortable,” says Hellmuth. “So we’ve created mounts in the locker rooms here that allow us to easily snap the cameras in and snap them out. If the coach agrees to a live shot from the locker room, the camera snaps in place, we do the live shot, and then we snap the camera out and walk away with it. In other robo news, a pan-bar robo is also being used in low-slash positions at Thomas & Mack Center, requiring less space to operate than a traditional manned camera. A Hat Cam is also being tested to provide POV shots for off-the-court applications, such as in-arena entertainment and roving reporters. C360 is also on hand testing its 360-degree camera systems for a variety of official-review, broadcast, and streaming applications. For officiating, C360 has deployed its latest 360 camera system 38 ft. above the left foul line. With its 6K+ video (25X HD), the system offers a digital zoom that brings the width of the three-point line to a level at which it nearly fills the entire officiating monitor, still in HD quality. 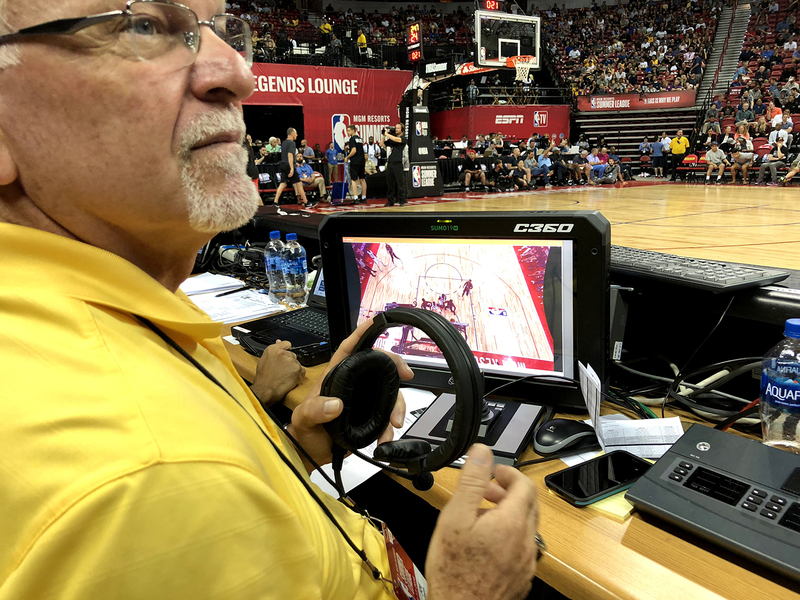 This provided NBA SVP, Replay and Referee Operations, Joe Borgia, on hand in Vegas to test the system, an unprecedented vantage point in a variety of key referee calls, including three-point shots. Development of this system will continue throughout the summer. Of note, the Summer League action fully utilized the NBA Reply Center in Secaucus, NJ, for the first time this year, thanks to Hellmuth and company’s extending the High-Speed Arena Network (HSAN) to Las Vegas. The operation sent 25 video signals to Secaucus via a 10-Gbps circuit. The same hanging C360 camera system is also providing an “all-22” perspective (or all-10, in the case of basketball), creating zero-angle video for game telecasts. This creates a completely unobstructed vantage point that will be key in enhancing the value of telestration. This camera system is also mounted in the industry-standard above-the-rim robo position on the backboard, although it is much smaller than traditional robotic-camera rigs and provides a wider/higher-res view of the court. It is controlled by a joystick and control panel and could potentially be located at any “at-home” control room. 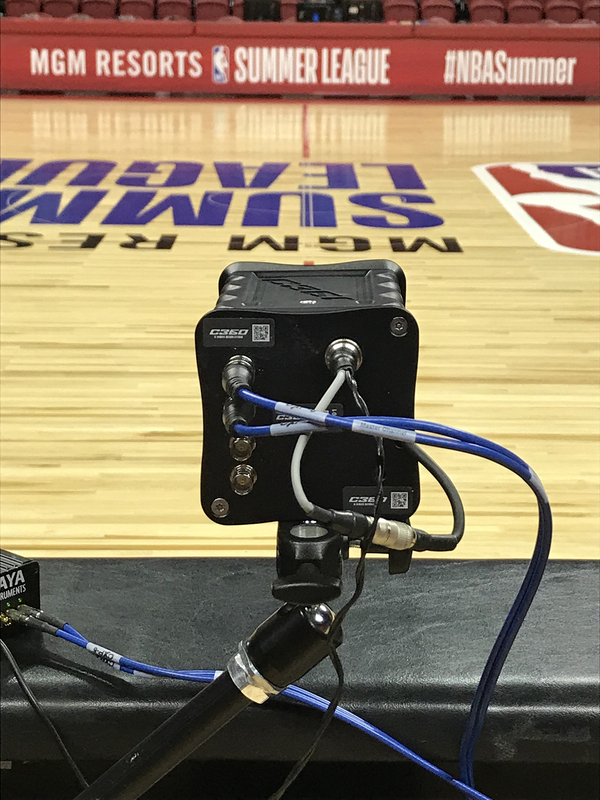 Recognizing the loss of the midcourt handheld camera in recent years (in favor of increased courtside seating), C360 is deploying the same system at midcourt, providing the coveted front-row-seat angle for basketball coverage without taking up significant space. The NBA is leveraging the streams from these C360 systems to create content for the NBA AR app. Since the output of the C360 camera system can be “directed” live by the individual end user, fans could have the ability to change the camera angle and perspective. This opens doors to new immersive experiences that virtually transport fans onto the court and behind the scenes. 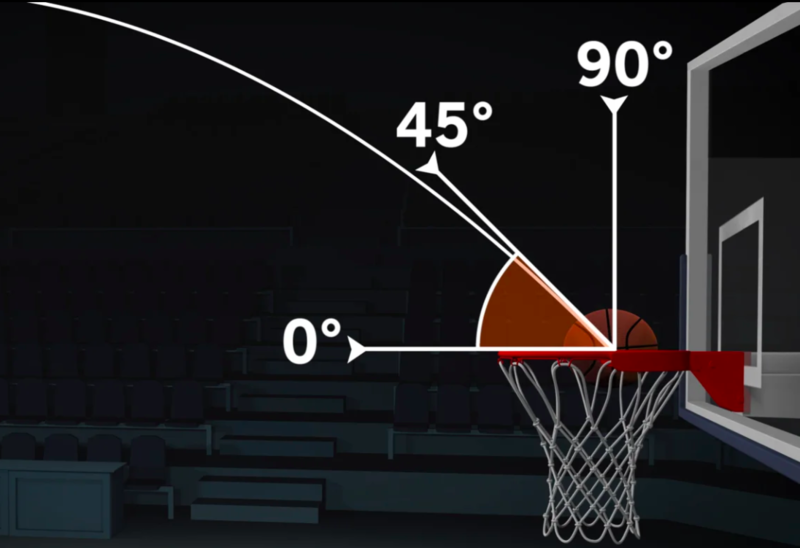 The NBA is testing the Noah Basketball shot-trajectory tracking software, which uses a small Intel sensor on the basket to track the ball from the shooter’s release point to exactly where it hits the basket to create a pinpoint trajectory. Summer League marks the first time the NBA has integrated the Noah Basketball system with a Vizrt plugin to create next-level shot-trajectory graphics. The Noah shooting system being tested at NBA Summer League measures the arc, depth, and left right of every shot. In addition to integrating these graphics into broadcasts to show fans the trajectory of shots, the technology is also being used for NBA Replay Center testing for goaltending and made shots. The NBA has enlisted Supponor to provide virtual-signage–replacement technology on the courtside Daktronics LED boards that will allow the league to deploy different ads across its global distribution feeds. Supponor has outfitted courtside LEDs with plexiglass overlays specifically manufactured for Summer League and infused with infrared light. Although the technology does collect information from the camera and lens, it operates downstream from the live-video operation, meaning that there is zero delay in inserting the virtual signage. Hellmuth adds that this could potentially allow the NBA to locate this operation remotely in Secaucus as opposed to having the necessary equipment onsite. The NBA is also testing Riedel’s new, slimmer Bolero wireless intercom system (officially dubbed Bolero S) in an effort to conduct interviews with players, GMs, coaches, and others wherever they are in the arena rather than force them to trek to the announcers table. Using the Bolero S system, the NBA production team was able to cover the entire bowl at Thomas & Mack Center, encompassing two courts, with a single antenna. According to Riedel, Bolero S will be offered as a managed service through partners in North America. It has most of the same technology as the full-size Bolero but comes in a far smaller case for easy access and use. Because it has all of the same programmability as Bolero, use cases range from referee mics to basic announcer standup positions. Each pack has four duplex channels and a pair of buttons for volume up/down. There is no display, and the battery is non-removable.